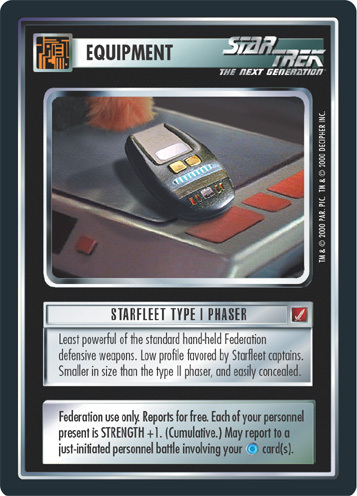 Least powerful of the standard hand-held Federation defensive weapons. Low profile favored by Starfleet captains. Smaller in size than the type II phaser, and easily concealed. Federation use only. Reports for free. Each of your personnel present is STRENGTH +1. (Cumulative.) May report to a just-initiated personnel battle involving your card(s).